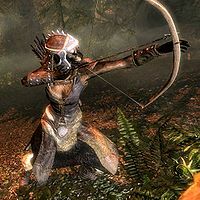 Tsrasuna, a Khajiit bandit, is one of the hunters who shows up in Bloated Man's Grotto hunting Sinding. She is clad in a set of hide armor, matching pairs of bracers and boots, and a matching helmet. She wields a long bow coupled with twenty iron arrows, an iron dagger, and a leveled mace and shield. She also carries a leveled potion of restore health. This page was last modified on 15 February 2014, at 08:40.